The B'nai Israel Section is a treasure of Broward's Jewish heritage. It is the final resting place for members of the earliest Jewish community that helped build Broward County. And the living have hallowed ground to visit, and a place to remember and honor their ancestors and other loved ones. 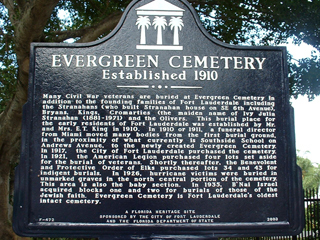 Many Civil War veterans are buried at Evergreen Cemetery in addition to the founding families of Fort Lauderdale including the Stranahans (who built the Stranahan House on SE 6th Avenue), Bryans, Kings, Cromarties [the maiden name of Ivy Julia Stranahan] (1881-1971) and the Olivers. 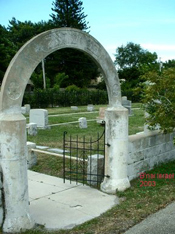 This burial place for the early residents of Fort Lauderdale was established by Mr. and Mrs. E.T. King in 1910. In 1910 or 1911, a funeral director from Miami moved many bodies from the first burial ground, in the proximity of what currently is Southside School on Andrews Avenue, to the newly created Evergreen Cemetery. In 1917, the City of Fort Lauderdale purchased the cemetery. In 1921, the American Legion purchased four lots set aside for the burial of veterans. In 1926, hurricane victims were buried in unmarked graves in the north central portion of the cemetery. This area is also the baby section. In 1935, B'nai Israel acquired blocks one and two for burials of those of the Jewish faith. Evergreen cemetery is Fort Lauderdale's oldest intact cemetery. 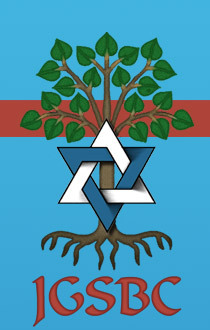 In response to intense lobbying by nearby residents and the Jewish Genealogical Society of Broward County, in 1998-99 the City of Fort Lauderdale made significant improvements to the B'nai Israel site. It included masonry wall repairs, wrought-iron gate restoration, landscape upgrading and perimeter wrought-iron fencing. The cemetery grounds and facilities are in good condition and provide the dignified and respectful setting that the interred deserve. Grave markers recorded July 1991 by Bernard Israelite Kouchel, Jewish Genealogical Society of Broward County.